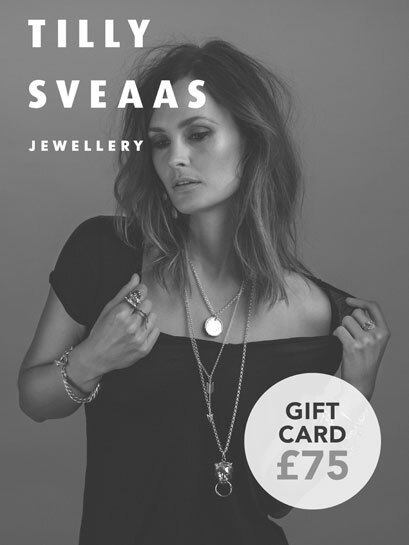 This gift card allows the recipient to spend £75 on Tilly Sveaas Jewellery. Gift cards can be exchanged for Tilly Sveaas merchandise online at tillysveaas.co.uk. Gift cards cannot be exchanged or refunded for cash. Gift cards can be used towards the purchase of goods at a higher price than its face value, upon payment of the difference. Tilly Sveaas is under no liability for replacement or refund should vouchers be lost, stolen, damaged or destroyed whether they have been redeemed or not. Gift cards are only valid with a unique Tilly Sveaas code. This gift card allows the recipient to spend £50 on Tilly Sveaas Jewellery. This gift card allows the recipient to spend £25 on Tilly Sveaas Jewellery. This gift card allows the recipient to spend £100 on Tilly Sveaas Jewellery.